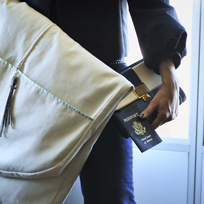 Give lux: Jet Set organic garment bags! lux bags are lined in lightweight silk dupioni in six color options ranging from sorbet hues like surf and orchid, to black. lux and lux lite allow you to store up to five items, leave room for accessories at the bottom and include a small internal pocket for jewelry items. Jendarling places a high emphasis on quality and craft and pursues a rich color palette while utilizing the finest and organic-friendly materials such as organic cotton twill and hemp blends, 100% cotton duck and twill, and the not so sound, but stylish 100% silk and leather. As no two closets are alike, Jendarling’s goal is to offer a myriad of textiles available to everyone from the environmentalist to the fashionista (o). We feel that any cotton, regardless of its background is a much more sounder practice than the use of plastic. Each bag is crafted in California, true to its roots. The Jendarling label starts the heat press stamp in Napa, and continues on to a small local leather manufacturer in Marin County, California. With a high emphasis on textile certification and fair labor, both the lux and lux lite lines are socially aware of its surroundings. Jendarling bags are truly for those who take their idolized threads and environment seriously.